Yesterday, Robin Williams died. No matter how you feel about his films, you undoubtedly believe that we lost a brilliant man, who devoted his life to bringing laughter to the world. A big gamer, and a massive geek, he was present for a lot of my, and I’m sure a lot of your, favourite geeky moments. We lost him to depression, which I believe with the fullness of my heart is the worst thing to lose somebody to, because it’s an issue that should be helped with and supported, and nobody should leave Earth feeling that they weren’t cherished. Yesterday, Depression Quest released on Steam. This was a total coincidence. Literally 5 minutes before the game was supposed to go live, the terrible news broke. The developer has written a piece talking about their decision to still go live, and how difficult a choice it was to make. They didn’t want to capitalise on a tragedy, and therefore debating launching the game later. However, due to the nature of the tragedy, they decided to go ahead anyway, and hopefully help more people. You can read that full post here. Depression Quest is a game that talks about dealing with depression. It’s poignant and powerful, and deserves a play-through if you’ve ever found yourself dealing with it. 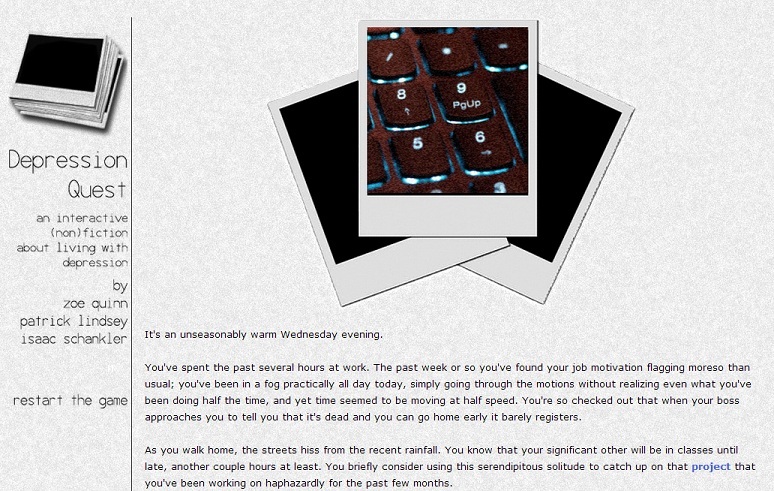 The game, which is a interactive story, takes you through the life of somebody living with depression. Although it can be paid for through a “pay-what-you-want” feature, Depression Quest was made to raise awareness of the often stigmatised issue, and as such is playable totally free of charge. Because of this, a portion of proceeds are sent to iFred, a charity that aims to fight back against depression and the stigma against it. I highly recommend playing Depression Quest, especially if you find yourself facing the same issues as are portrayed in the game. It helps educate, and also provides a good way for people that haven’t experienced depression a way to identify and understand what others are going through. It can be picked up and played here, for free. It’s also on Steam now. And hey, everybody reading this. You’re loved.